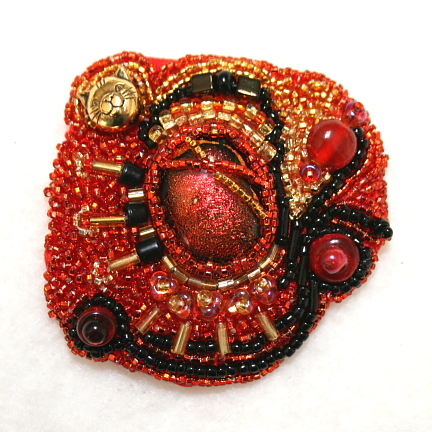 as for me, just did some beading today and finished another pin. i must admit, there is something poking at me – one of those ‘is that all there is?’ kind of pokes. a hint of ‘boredom’??? keep looking at fabric and trying to figure out where i’m going. no, won’t stop doing the applique patterns – just looking at doing something more in the art/ready-made arena. beaded wallhangings – very small!! we shall see what shows up. in the mean time, here’s the latest one. doesn’t have a back yet, so not officially finished. and – have you ever gone to the mailbox and opened it to find a million tiny ants!! guess it’s good i wanted to mail something so the postman didn’t get the surprise!! used a powder – sure hope they were mostly gone by the time he/she got here! !